Here you will get complete information regarding Fauji Foundation Scholarships for Master Level Students. Fauji Foundation recently announced scholarships for master level students. Therefore, don’t miss it, if you are a master level student i.e MA, MSc, MBA & MCOM etc. Fauji Foundation Educational Stipend Scheme is the oldest education welfare measure of the Fauji Foundation. The benefits of this scheme are reaching Beneficiaries studying in schools, colleges & universities. As well as those undergoing professional/technical education. It started in 1954 and has continued ever-since, uninterrupted. The number of awards in 1954 was 1,586, and the amount spent was Rs 0.338 million. In session 2017-18 the number of awards were about 49,173 and the amount allocated, Rs. 203,345 million. Court Martial cases, discharged from service being ill-disciplined/inefficiency (irrespective of service limit), dependents of Pak Rangers/Janbaz/Mujahid Force (Less 10 Corps Mujahids) / Frontier Corps, Scouts/Army Postal Service, Recruits (other than para 1. C. (1) above), civilians paid out of defence estimates and East Pakistan Rifles. Students studying in those classes of Dini Madaris for whom equivalence certificate has not been provided by the Ministry of Education/University Grants Commission/ Higher Education Commission. Students studying in Military Colleges except wards of Shuhada. Applicants for Post Matric Group who have obtained less than 60% marks in the last final Board/ University examination or in intervening classes. Stipend already availed for the class applied for. Application pertaining to previous academic session. If duration of the course is less than one year. Form B/CNIC number differs from the previous record. Stipend application received in-complete in any respect and after the due date. If a student sends more than one application for the same session/ class, Fauji Foundation reserves the right to reject all the applications. Disciplinary cases debarred from receipt of either pension or gratuity. Voluntarily retiring before completion of 10 years of service. Invalided out, cause not attributable to military service. Discharged for not being found fit for further service prior to completion of 10 years of service. Stipends are restricted to only THREE children of an ex servicemen/women (in addition to invalid/special children) for all categories irrespective of date of retirement. However, there is no restriction for wards of Shuhada, Deceased and disabled ex-servicemen/women. It is essential that application forms are correctly and neatly filled up in English (Capital Letters) and all portions/sections completed. While submitting the application, the applicant MUST read the instructions printed on the form so that forms are not rejected/returned from this office. Applicants of NUST and Defence Forces Institutions can also forward their applications for Higher Professional Courses Award through respective institution. Release Order/Discharge certificate / pension book of self/father or mother. In case drawing of disability pension copy of pension book duly attested must be attached. National Identity Card of father/ mother. National Identity Card or NADRA issued Form ‘B’ of applicant. Death certificate/Disability certificate of father /mother (if applicable). In case a disabled beneficiary is studying in a normal school, the Disability Certificate only obtained from District Disability Assessment Board or FF Hospital/ Centre will be acceptable. Medical certificate issued by an ordinary medical practitioner will NOT be accepted. 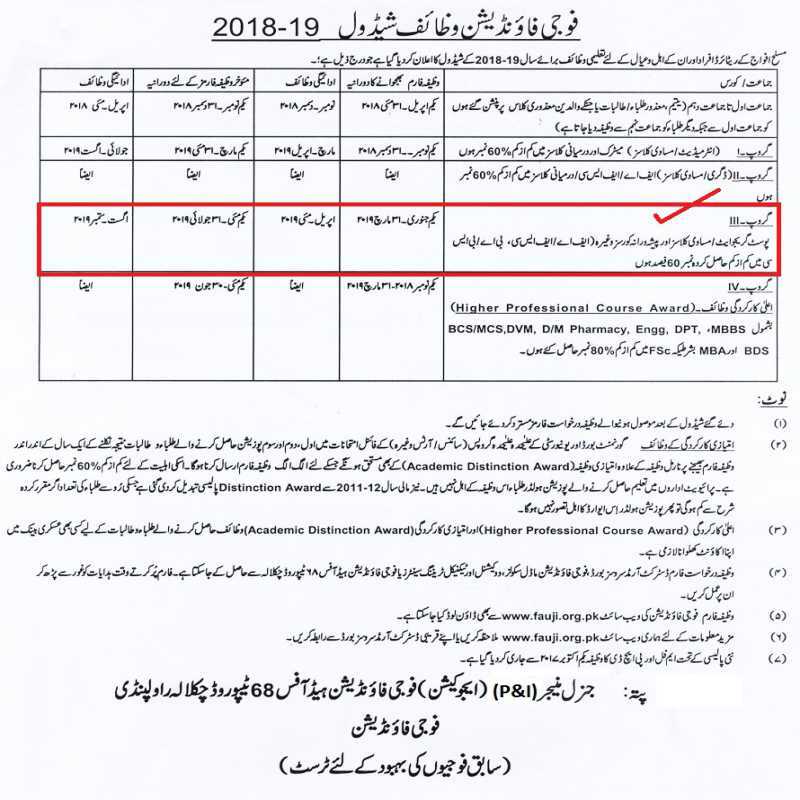 Detailed marks sheet for Post Matric classes, duly attested by head of present educational institution or Asst/Dy Dir DASB or a Commissioned Officer (Serving or retired). Downloaded copy must be attested by HOD/Principal. NOTE: Related section of the application form must be signed by Head of the Educational Institution. Section IV of the form and all other documents must be attested by Assistant/ Deputy Director DASB or Commissioned Officer (Serving/Retired) clearly showing Army number, Rank & Name. DMC (Detailed Marks Certificate) can, however, be attested by head of present educational institution. Attestation of documents of owns children by an officer are not acceptable. Payment of Stipend: Stipend will be paid through money order in the name of the student at home address. Money order charges are deducted from the stipend amount.